FC Barcelona were so incredibly dominant in victory over Sevilla on Saturday night at the Wanda Metropolitano that the post-game celebrations were perhaps somewhat more subdued than they tend to be on these occasions. It’s not that it didn’t matter that much – quite the contrary, a fourth consecutive domestic cup title is an amazing achievement that warrants celebrations of the very highest category. But the 5-0 win in such a one-sided game meant that the players already knew the trophy was as good as theirs long, long before referee Gil Manzano finally put los sevillanos out of their misery once the ninety minutes were up. 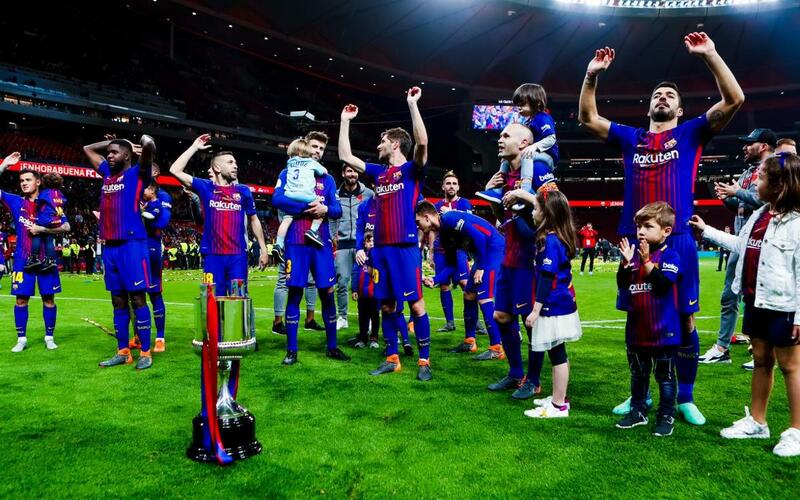 All the same, there was still an outpouring of emotions, and none more so than from Andrés Iniesta, in tears by the end of it, and there were smiles all round as the players celebrated what goes down as an astonishing thirtieth cup title for the blaugrana. While Iniesta collected the coveted trophy, the player’s nearest and dearest joined them on the field at the Wanda, with the ubiquitous ‘We are the Champions’ by Queen providing the soundtrack, as it has done so many times before, for the celebrations of one of the most remarkable nights of so many remarkable nights in recent FCB history.